Olentangy Orange’s Tatum Bardash slides under the tag of Olentangy Liberty’s Sammy Leonhardt during Wednesday’s game in Powell. POWELL – Katelyn Wilhelm outdid herself with 19 strikeouts. The senior right-hander went the distance in the circle and added a two-run triple to blow open a 6-1 victory for the Olentangy Liberty softball team over rival Olentangy Orange to open OCC-Buckeye play under the lights Wednesday night. Wilhelm got her first 12 outs via the strikeout, including nine of the first 10 batters she faced. She allowed just one hit, walked four and hit a batter. It’s the sixth time already this season that Wilhelm has struck out more than 10 batters in a game, surpassing her high-water mark of 17 in a victory over Central Crossing Apr. 3. Wilhelm is no stranger to big games in the circle. She pulled a Johnny Vander Meer with back-to-back no-hitters her sophomore year. Arica Flaugher hit a sacrifice fly in the first inning to give the Patriots (9-3, 1-0) the lead. 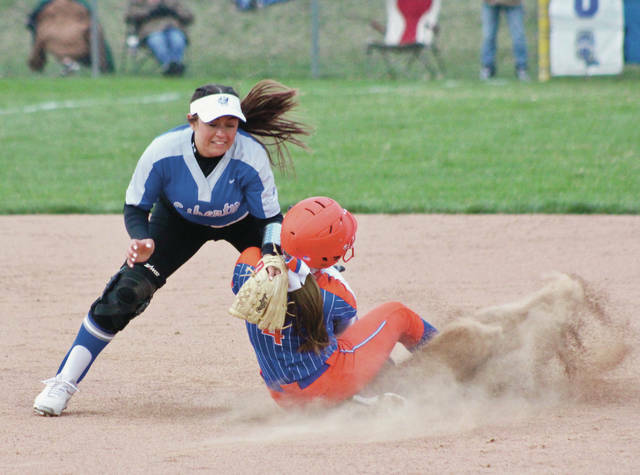 Orange pitcher Brenna Oliver was seemingly finding her grove until a Dani Schoenly blooper fell into no-man’s land in right-center with two outs in the third inning. Flaugher followed with a no-doubter over the wall in center to push the Patriot lead to 3-0. Robinson spent last season with Liberty as an assistant. Morgan Powell led off the fifth inning with a walk and pinch-runner Delaney Phillips stole second and moved to third on an error before scoring on an Alli Rubal groundout to break up the shutout for the Pioneers. Wilhelm finished off the scoring in the sixth inning when she hit a ball off the base of the wall in right-center to drive in two runs. She scored on the play because of a throwing error. Oliver went the distance for the Pioneers (2-5, 0-1), but suffered the loss. She allowed six runs, five earned, on eight hits and two walks and struck out four. Teresa Hawk broke up the no-hitter in the fourth with a single to left. Liberty accepted canned food donations on behalf of People in Need of Delaware County. DeAngelis said before the game the drive and playing rival Orange was a great excuse to play under the lights. Both teams continue league play today. Orange hosts Westerville Central and Liberty travels to Westerville South. First pitch is scheduled for 5:15 p.m. for both matchups.